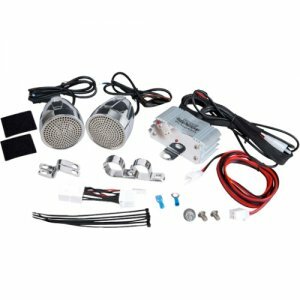 This weatherproof speaker system is what you need to listen to high-quality auto on your motorcycle, ATV, or snowmobile It comes with two 2.25" bullet-style 50-watt weatherproof speakers and a 300-watt amplifier. Plug your MP3 player or iPod into the included 3.5mm jack to listen to your favorite music on this stylish system. Take total control of your sound with the included volume, treble, and bass digital controls. Easy mounting brackets and accessories are included to make installation a quick process. Now you can listen to music on the go, anywhere - thanks to Pyle's Cycle Series speakers and amplifiers.